MM6 World Record Score : 1,534,175 points ... 7 days finish, almost naked, ofcourse Lvl 1... Mark my words this aint a fool ssspeedrun, quests are done as much as possible. The score is certainly impressive. Whether it is some kind of world record or not remains unknown since many people have achieved great scores, but most of these playthroughs were over 20 years back. Who play MM6 today, probably play some kind of modified version. Also, AFAIK most people do not consider NWC dungeon as a part of the game and do not use items or money from there. But that is the beauty - everyone can come up with rules and restrictions that make the game fun for him/her. Last edited by Pitsu on Jan 3 2019, 7:46, edited 1 time in total. Pitsu wrote: The score is certainly impressive. Whether it is some kind of world record or not remains unknown since many people have achieved great scores, but most of these playthroughs were over 20 years back. Who play MM6 today, probably play some kind of modified version. Also, AFAIK most people do not consider NWC dungeon as a part of the game and do not use items or money from there. But that is the beauty - everyone can come up with rules and restrictions that make the game fun for him/her. Why leave? 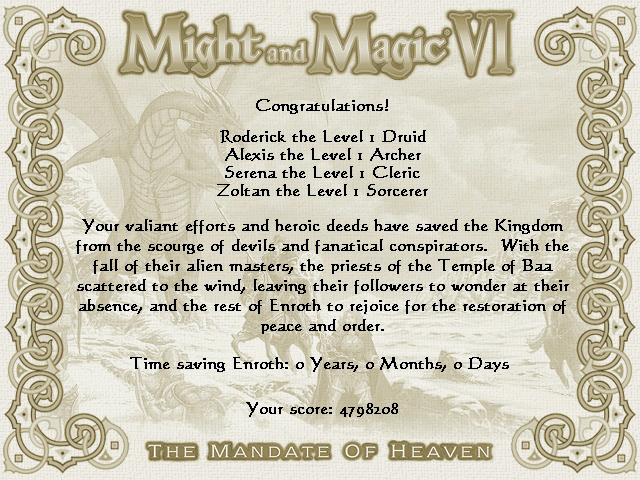 If you're a fan of the Might & Magic series, you should stay. Have you played BigDaddyJim's Chaos Conspiracy mod for MM6 or the Rev4ModF for MM7? If not, you should. You should also try out Rodril's MM6-MM8 merge mod. Those are amazing. On top of all that, you should play the games with GrayFace's patch installed. There's a couple other mods lurking around that are enjoyable. Last edited by Anubis on Jan 4 2019, 0:43, edited 1 time in total. Anubis wrote: Why leave? If you're a fan of the Might & Magic series, you should stay. Have you played BigDaddyJim's Chaos Conspiracy mod for MM6 or the Rev4ModF for MM7? If not, you should. You should also try out Rodril's MM6-MM8 merge mod. Those are amazing. On top of all that, you should play the games with GrayFace's patch installed. There's a couple other mods lurking around that are enjoyable. If you need help installing/playing any of these mods, feel free to post in the other relevant threads and someone will help you. I recommend playing BigDaddyJim's Chaos Conspiracy mod for Might and Magic 6 first! Last edited by Anubis on Jan 21 2019, 9:24, edited 1 time in total. While i understand general idea of 5-7 day run, how exactly you get 0 days spent ? Which glitches are used. I know that at least in my version i could get access to npc like oracle by abusing some bugs (release companion and it got replaced with random one, including oracle.) But getting 0 days is kinda intriguing. At the start of the game, you need to buy lloyd's beacon and town portal at least. Then, set beacons in places you would otherwise need to travel to like sweet water, hermit's isle, etc. Now you might notice some days have passed, here's where the glitch comes in. Make all characters inactive and ctrl+click one of them to move some memory around (commonly known as the 5th slot glitch). Now wait for the goblins to kill you. After that, make everyone inactive again and ctrl+click the same slot as before. The time is now 12:00 AM 1 January 1165 regardless how many days you might've spent so far. Note: the game normally begins at 9 AM, here's what happens if you finish the game before then https://i.imgur.com/FmHyAaU.png. Thanks to lloyd's beacon and town portal you never have to travel or rest (to heal) again. One drawback is that you can't start or do any quests before performing the glitch as it makes the game crash. This means you have to wait for the stables to open to fix the prices. Hopefully that's all, ask away if you have any questions. Now, I'd like to hear about this glitch regarding accessing NPCs by fiddling with followers. Not exactly sure if that can be reproduced on normal version of the game, but back when i played game in 199xies i had half translated Russian version(Obviously not too legal one, but there wasn't really proper one to be get ). But at some points if i had NPC hired , and i would release them i would automatically get NPC in his stead. usually same one so i had to fire him again, but at least once i got oracle this way. Due to that i never used NPC;s too much as it risked to permanently lock me a slot. Thanks Anubis... I will play just one more time the old original version for you... Just to show how it can be done without some keyboard helps... I really dont understand what the glicth means ? Anerag wrote: With the help of some glitches, I achieved this score with only what's possible in the game and no outside help. Certainly not the highest possible score, more like a proof of concept. Played on the GOG release. So we got before (15 years ago) game logs saves... But then others understood who we are and never needed to put game logs to internet. You can take Gatemasters ... for some destinations. Any doubts pls check my old friend Seoman game log... again..
İf anyone put here over 1.000.000 score... then i say Talented. Anubis.., i couldnt find a way to thank thee... It's really nice to play with Grayface's patch. INCOGNITO wrote: 3. Save the game before click the dead Titans - then click - if you dont get any Artifact or what you needed - reload again. Anerag's glitches are more 'glitchy'. They took me by surprise when I saw them a few months ago. WRs with glitches are always fascinating. INCOGNITO wrote: So we got before (15 years ago) game logs saves... But then others understood who we are and never needed to put game logs to internet. Me and my father also wanted to participate back in the day, but then found out during the run that the contest didn't accept runs with use of NWC (rather arbitrary restriction IMO). AFAIR, my father did a 100%(except Nicolai's circus) run and I finished in about a week with lvl 1 party. Last edited by GrayFace on Feb 24 2019, 10:37, edited 3 times in total. Last edited by Anubis on Feb 24 2019, 12:33, edited 1 time in total.